Cellular automata can be used to generate artistic patterns with an appearance of randomness, or to modify images such as photographs by applying a transformation such as the stepping stone rule (to give an impressionist style) repeatedly until the desired artistic effect is achieved. ↑ Hvidtfeldt Christensen, Mikael. "Hvitfeldts.net". Retrieved 2 October 2015. 1 2 3 4 "Approximating Reality with Interactive Algorithmic Art". University of California Santa Barbara. 7 June 2001. Retrieved 25 December 2015. 1 2 3 4 5 Verostko, Roman (1999) . 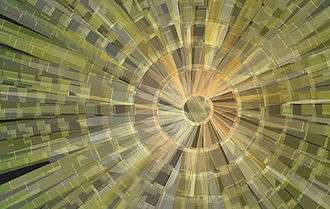 "Algorithmic Art". ↑ Flanagan, Mary. "An Appreciation on the Impact of the work of Sonia Landy Sheridan." The Art of Sonia Landy Sheridan. Hanover, NH: Hood Museum of Art, 2009, pp. 37–42. 1 2 Mitchell, Kerry (24 July 2009). Selected Works. Lulu.com. pp. 7–8. ISBN 978-0-557-08398-5. 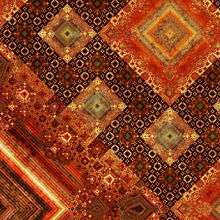 This artist is notable for his place in the Fractal Art movement, as is his opinion and manifesto. ↑ Mitchell, Kerry (1999). "The Fractal Art Manifesto". Fractalus.com. Retrieved 27 December 2015. ↑ Hoke, Brian P. (21 August 1996). "Cellular Automata and Art". Dartmouth College. Retrieved 24 December 2015. ↑ Bovill, Carl (1996). Fractal geometry in architecture and design. Boston: Birkhauser. p. 153. ISBN 0-8176-3795-8. Retrieved 28 October 2011. ↑ Conner, Elysia (25 February 2009). "Meet Reginald Atkins, mathematical artist". CasperJournal.com. Retrieved 28 October 2011. ↑ Eberle, Robert. "Evolutionary Art - Genetic Algorithm". Saatchi Art. Retrieved 25 December 2015. ↑ Reynolds, Craig (27 June 2002). "Evolutionary Computation and its application to art and design". Reynolds engineering & Design. Retrieved 25 December 2015.
geneticart.org - Algorithmic art based on the 1994 work of John Mount, Scott Neal Reilly and Michael Witbrock (now hosted at MZLabs). RoBCode Generator //github.com/rbur004/svg_rob_code ( Play ).